The Hoverboard by Mattel is a hovering vehicle for children, similar to a skateboard in design and use. In Back to the Future Part II, one of the most memorable scenes was the hoverboard chase that took place in 2015. Presumably powered by the same technology that made flying cars and floating signage possible, they were also one of the more far-fetched elements depicted in the film’s future world. Hoverboards that appeared in the film came in a variety of makes and models, all of which were designed by concept artist John Bell. 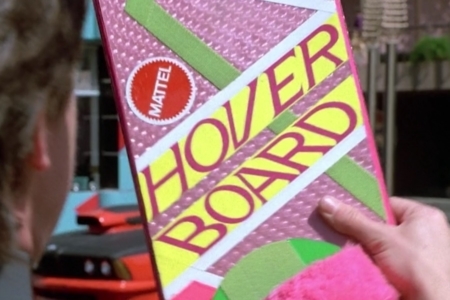 In the case of Marty’s, that he borrows from a child in the park, it was a Hoverboard by Mattel. As Bell noted in an interview though, his first drawing of Marty’s hoverboard featured a Swatch logo, due to the popularity of its brand at them time. 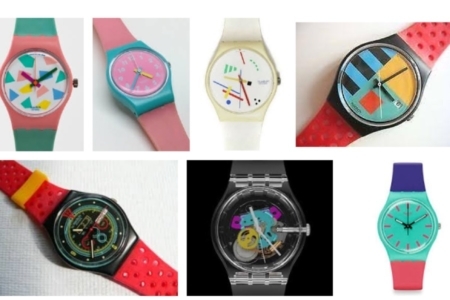 If you’re unfamiliar with Swatch, it is a Swiss watch company that started making colorful plastic watches in the 1980s (Figure 2.2). 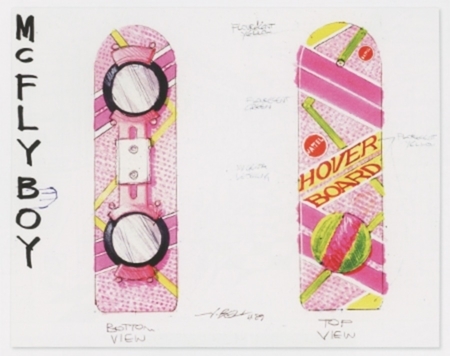 In the final drawing for what was used in the film, the brand was switched to Mattel (Figure 2.3), even though the graphics that appeared on the hoverboard still retained that Swatch look, with its quintessentially 80s use of shape and color. 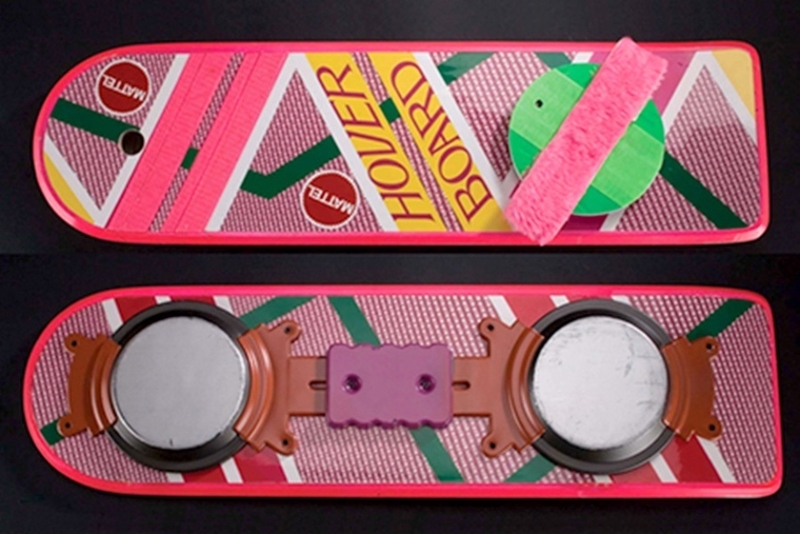 Thanks to a 2014 auction by The Prop Store, we have access to good images of the actual Hoverboard prop from the film. For this reason, and the fact that the logotype’s application was limited to this one prop, I didn’t worry about approximating the logo design. The Hoverboard product logotype has the name broken into two words, HOVER and BOARD, in skewed type appearing on an angle across the top of the board. The type appears to be hand lettered, and based on the original drawing (Figure 2.3), with serifs trailing the letterforms on the left side. Those serifs, along with the skewing of the type, imply motion and speed. As far as style goes though, this is not a very “futuristic” logotype, and the type has some wonky rendering in places, as the production artist wrestled with the oblique letterforms. Regarding colors, the Hoverboard logotype appears in magenta, over yellow. The overall color scheme fits the gender stereotype for a girl’s toy, being mostly pink, but I’m not sure if the logotype’s color was unique or something that would be consistent across products — on a boy’s hoverboard, for instance. There was another girl riding alongside the one Marty gets his Hoverboard from, and she had what appeared to be a Mattel Hoverboard in yellow and orange. Unfortunately, the film didn’t provide anything more than a glimpse of that board, so the logo in this instance could not be seen. I’ll also note that the Mattel logo appeared slightly modified. It should have had the white lettering for Mattel large enough for the M and L to break the edges of the red sunburst containing shape. What we see comes up a little short, and is fully contained by the shape (Figure 1.1). 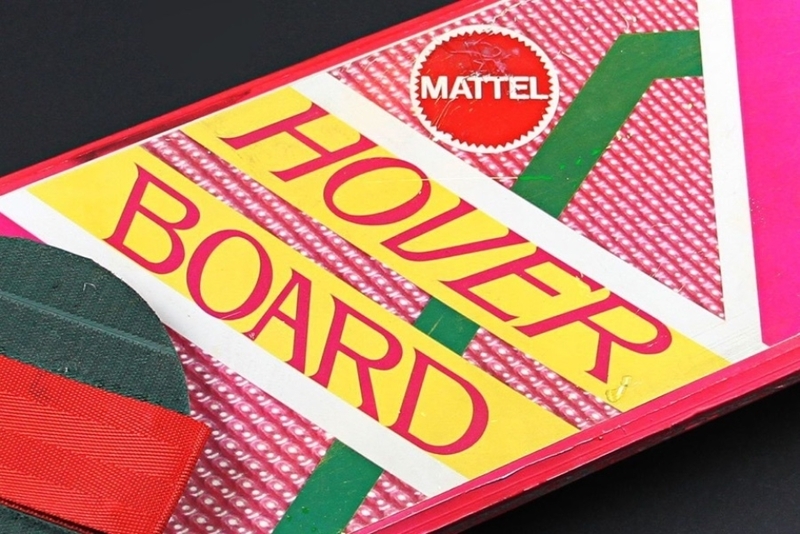 Overall, the visual identity for the Mattel Hoverboard really plants it in the decade of the film’s creation, in spite of the still futuristic product it is branding. But as a child of the 1980s, I can say that its styling registered with the intended audience at least, which was the main goal of the film’s creators. 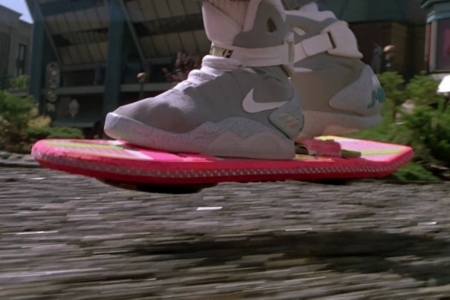 Figure 2.1 The Hoverboard in action, as Marty uses it to evade Griff’s gang.